February 10th, 2016: In today’s show I had the privilege to enjoy Teri Page’s company once again of Homestead-Honey.com. 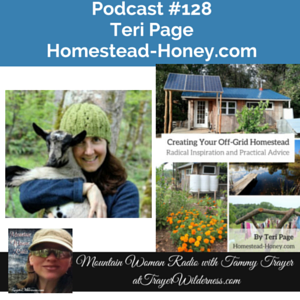 We spoke about the additions of her root cellar to her homestead and her new book Creating Your Off-Grid Homestead:Radical Inspiration and Practial Advice. Teri provided all our listeners with a 20% off discount. Use coupon code Wilderness. The code will be valid from January 1 – February 29, 2016.